Do you need our Bed Bug Heat Treatment in Warren County, New Jersey? Warren County, NJ Bed Bug problems are becoming very common, resulting in an increase of bed bug bites and infestations. Bed Bugs are those annoying little pests that feed on humans' blood while they sleep, and there's more to them that meets the eye. Not only do their bites cause itchy red bumps that are hard to get rid of, but they can live anywhere, they're almost immortal and reproduce very quickly, and require proper, professional bed bug heat extermination in Warren County, New Jersey; along with other requirements to be fully terminated. Think you might have Bed Bugs? Call BedBug Chasers Today at 908-698-4709 to schedule a Bed Bug Inspection! 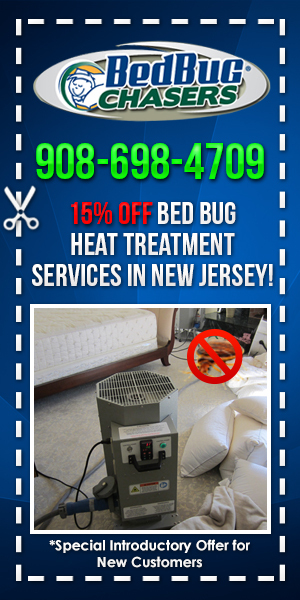 Special Deal: 15% Off Bed Bug Heat Treatment in Warren County, NJ! Did you know that bed bug infestations in Warren County, NJ, don't just happen to home owners? Bed bugs can be found in a variety of places, from college dorms to prisons, from nursing homes to cruise ships, and from theaters to airplanes, hotels, commercial properties and offices, military bases and more. Bed bugs really can live anywhere, and that makes bed bug heat treatment in Warren County, New Jersey really important! 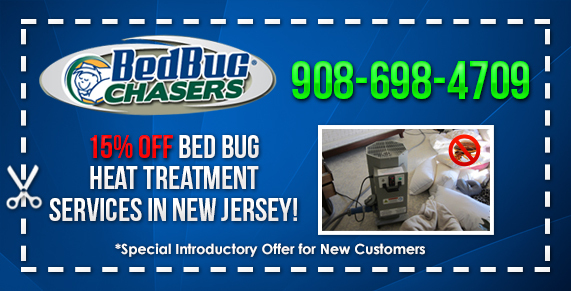 Call Our BedBug Chasers Team at 908-698-4709. Bed Bugs in Warren County, can and will reproduce rapidly, starting with one pregnant female will turn into an infestation of over 13,000 bed bugs in only 6 months! Not only do they reproduce quickly, but bed bugs can live in temperatures up to 122 degrees Fahrenheit! Bed bugs are tough little pests, and before you realize you have one, you have a few thousand. At that point, you'll a need professional bed bug heat treatment in Warren County, New Jersey. Do you Think you might have Bed Bugs? So why choose the heat treatment method versus the other options that supposedly exterminate bed bugs in Warren County, New Jersey? Heat is the fastest, least expensive, and most effective way to kill bed bugs in Warren County, NJ. You could choose Bed Bug Chemical extermination in Warren County, but it takes a minimum of three treatments, a time frame of up to six weeks, and only the adults are killed, not the nymphs. Warren County Bed Bug Fumigation is another option, but it takes a lot of preparation and not only does the process take 3-5 days, but you must stay out of your home or property for one to two nights. What about Steam Heat and Freezing Methods for Killing Bed Bugs in Warren County, NJ? The Steam heat and Freezing methods of killing bed bugs not only damages your personal belongings, but it also can create another big problem; mold. Steam Heat and Freezing also don't penetrate walls or heavy furniture to ensure that all bed bugs are completely exterminated. Why Choose the BedBug Chasers - Bed Bug Heat Treatment in Warren County, New Jersey? Heat penetrates every nook and cranny, there's no dangerous chemicals or residue left behind, only one treatment is required, and if you have any other insects in your home, they will be exterminated as well! There's no doubt that bed bug heat treatment in Warren County, New Jersey; is the right choice if you have a bed bug infestation!